About a month ago, our hockey team tried to eat at Hotluck after the game. I emphasize "try" because we had arrived at roughly 9:55pm. Hey, no problem right? The placard in the front window clearly states they close at 11:00pm. Nope. When we tried to enter the restaurant, we were promptly denied. "No, we close" was the broken English answer. Huh? Close a full hour early? WTF? Honestly. I really, really cannot stand restaurants that make up random hours based on their own convenience. Yes, I do understand that the staff have their own lives too. But, what is the point of having any posted hours at all if they are not followed? Much like Poco Ocean, it's a crap shoot. Hey, what kinda job can you go in if you feel like it? 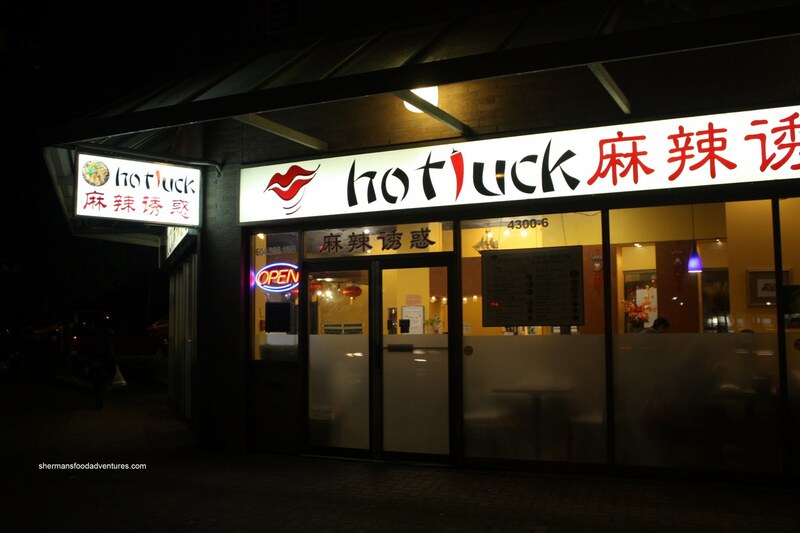 Wait, I forgot about politicians... Anyways, Viv and I were looking for eats around Metrotown and ended up at Hotluck. Hey, at least they were open this time. We ended up ordering their Hotluck Pot combo which included 2 predetermined appetizers, soup and rice. The soup was a pretty standard "lo foh tong" or old fire soup, which really means a soup that has been boiled for a long time. We got carrot, daikon and por k soup. 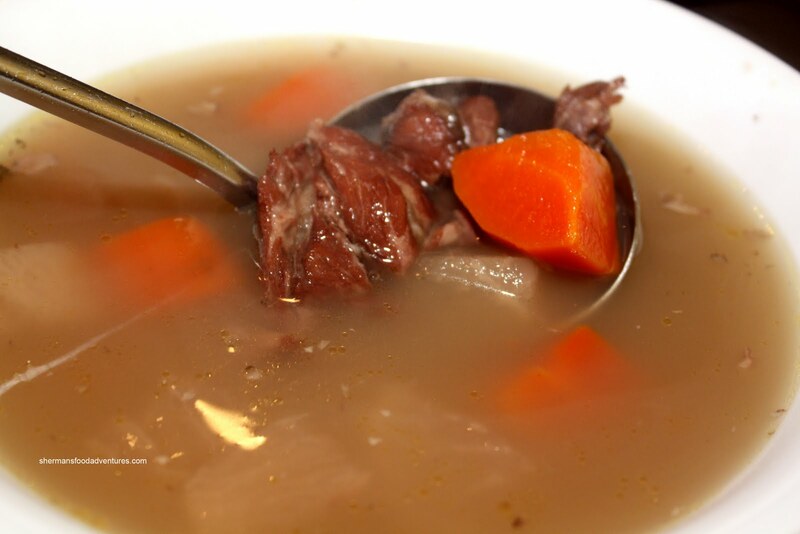 Not bad, moderately seasoned with nice big meaty chunks of fatty pork - my favourite part of any lo foh tong. One of the appetizers was the Pickled Daikon and Carrots. To me, that is not really an appetizer. It's more of a throw-in. Whatever, it was pickled and crunchy. The second appetizer was the Szechuan-Style Spicy Pea Curd. 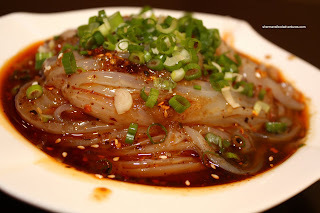 I liked the flavour, it wasn't too spicy and there was a nice vinegary kick. The pea curd itself was a bit hard to eat since it was very soft. For the main event, the Hotluck Pot arrived in a very big bowl. 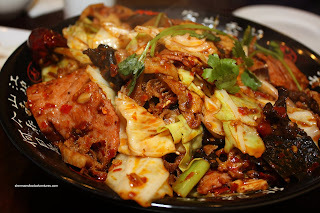 Packed with ca bbage, celery, seaweed, lotus root, wood ear mushrooms, chiyote, peppers, bean curd stick, tripe, pork, chicken and ham, this was not regular-sized dish. We asked for medium and even at that, it was very spicy. Normally, Viv and I can eat pretty spicy; but this was tongue-numbing. I can see how some people who really like it hot enjoying it; but for us, I found that it was slightly overkill. We could not taste any of the individual components. With that being said, the dish was cooked quite well. 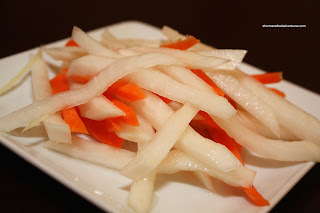 Veggies were crunchy and meats easy to chew. Although, we were a bit troubled by the really large pool of chili oil at the bottom of the plate. Okay, I'm probably basing everything on personal tastes here. As mentioned, I'm sure there are people who will like the tongue-numbing spiciness of the food here. However, for me, it was all I tasted. Hey, I've eaten my fair share of Szechuan cuisine and it can be more balanced than this. Furthermore, the prices seemed a bit high in relation to what you get. Don't get me wrong here, the food was alright and there is nothing inherently wrong. Probably just not on my list of re-visits anytime soon. Sherman, I drive on Kingsway on my daily work commute. And every morning, as I approach the intersection of Kingsway & Wilson (and if I'm stopped at the red light), I get an olfactory assault of fried garlic ..... IN my car, with the windows CLOSED, from Hotluck. I can surely sympathize with folks who live in the condo above Hotluck, or possibly even nearby businesses and people across the street. It's that bad, that strong. Perhaps the stink isn't so bad inside the restaurant. At any rate, it's one place I'm not rushing to try soon. Well, depending of what time of the day you drive by, you should notice the smell of curry coming from Saffron as well. Given that Saffron has been there for ages, I think the residents are used to it! LR, Hotluck is alright if you like it hot and have extra cash. Otherwise, I'd rather go to Alvin Garden (albeit a bit different) instead. Kim, I have friends who live there and indeed there is a smell.